The business end of Steve Foulks' Kubota B3030 and snowblower. 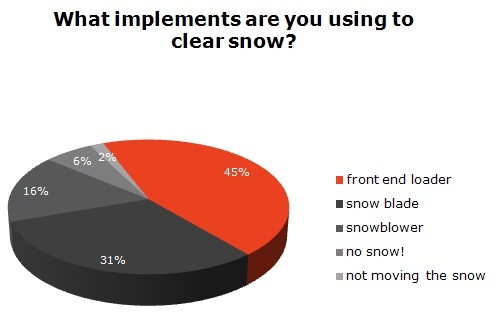 About two months ago we posted a poll inquiring what implements readers of OrangeTractorTalks use to clear snow with. Now that spring is on the horizon (in some places! ), we thought we would share the results. Voters could choose multiple selections on their entry but were limited to voting once per household. After more than 650 votes, those of us clearing the driveway so the family car, truck or van can get to town are clearly using the trusty front end loader to get the job done. 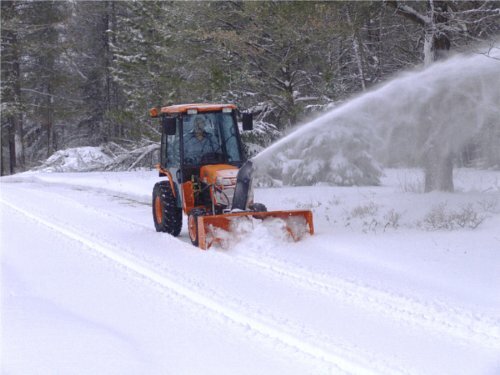 About 45% of responders relied on their loader versus 31% using a snow blade. Regardless of the implement, I think we have a dedicated batch of snow clearers!